The Bardiya National Park, situated in low mountains of Churia (Sivalik) of Nepal, is home to a small Indian rhinoceros population. During the ten years of the Maoist insurrection, the number of these animals has fallen from 109 to 31, mainly due to poaching, mostly in the Babai Valley. The Bardiya National Park’s authorities plan to strengthen the park’s security and repopulate it with rhinoceros. 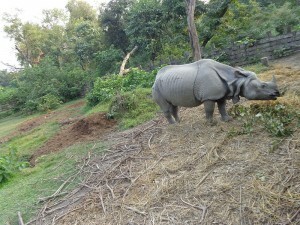 Thus, ten security posts have recently been established, and twenty rhinoceros, transferred from the Chitwan National Park, will be released this month, ten on the banks of the Karnali River and ten in Babai Valley. The Indian rhinoceros (Rhinoceros unicornis) is the biggest of the rhinoceroses. The animal is still remaining only in India and Nepal. It is listed as Vulnerable by the International Union for Conservation of Nature (IUCN).